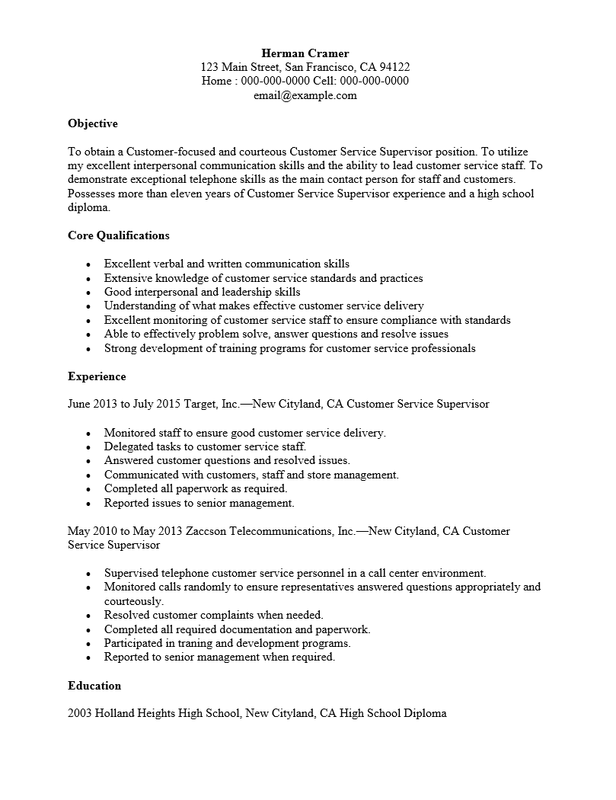 The Customer Service Supervisor Resume Template serves an applicant by giving them the tool they need to gain an in-person interview with a potential employer. This is done by having a clearly defined format which is preferable to most recruiters. An applicant will be required to fill out several sections meant to deliver a wealth of information to the reader in a sleek and presentable manner. An applicant must make an effort to make an attractive resume however since this is a template, it may be used over and over again. This means that if one wishes to customize a resume for each job inquiry most of the work is already done. Similarly they may use it in the future when they seek other positions. 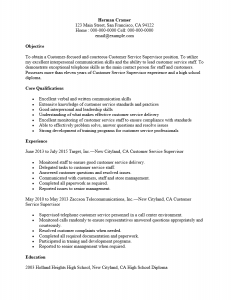 The Customer Service Supervisor Resume Template is thus, a reusable tool which will help a candidate introduce themselves to a potential employer as he/she attempts gain an interview. Step 1. The top of the page is reserved for the Name and Contact Information of the job seeker. This should be accurate and up to date. The name will go on the first line. The contact information will consist of the mailing address, phone number, and if applicable, email address. Step 2. The Objective is usually used to open a resume. This initial section will act as a synopsis of the candidate’s expectations in obtaining the position and how they well function in that role once hired. This tends to be in concise but descriptive. Step 3. The Core Qualifications section will list the knowledge and abilities a candidate possesses that would be considered useful to the desired position. Candidates should make sure they have addressed the requirements listed in the job description whenever possible. Step 4. The Experience section refers to one’s professional history. Recruiters will pay special attention to this section as it will not only serve to support the Core Qualifications section and, for Experienced Mid-level candidates, showcase why they are qualified for the position. Here, applicants must divulge the names and locations of previous companies they have worked for. In addition they must give the job job title and the dates they worked for that company. These pieces of information will be the first line of every entry. Directly below this line should be a synopsis of their accomplishments and/or functions in that positon. Step 5. The bottom of the page will be used to close the resume. This is often done with a section for Education. This will be where one lists general information for each certificate or diploma they have earned. As with the Experience section, each entry should have the name of the institution and dates attended.